Organize your favorite books on the Ameriwood Basics Collection Tally 5 Shelf Bookcase. 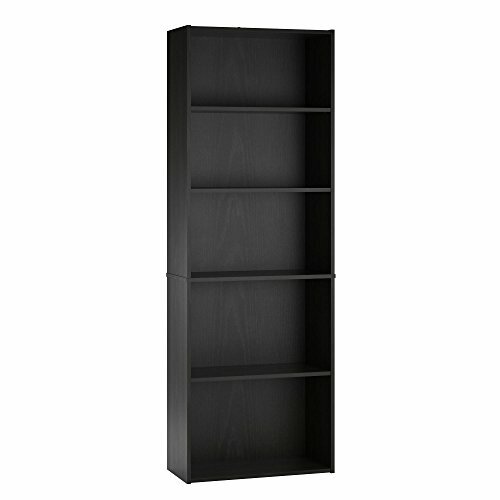 Made of laminated particleboard, the black oak woodgrain finish gives the Bookcase a classic look to fit any style! Display books, decorations, and photos on the 5 full sized open shelves. Four adjustable shelves allows you to customize the spacing to fit your needs. The Bookcase ships flat to your door and 2 adults are recommended for assembly. Each shelf will hold up to 35 lbs. Assembled dimensions: 72"H x 24.9375"W x 11.5625"D.
If you have any questions about this product by Ameriwood, contact us by completing and submitting the form below. If you are looking for a specif part number, please include it with your message.